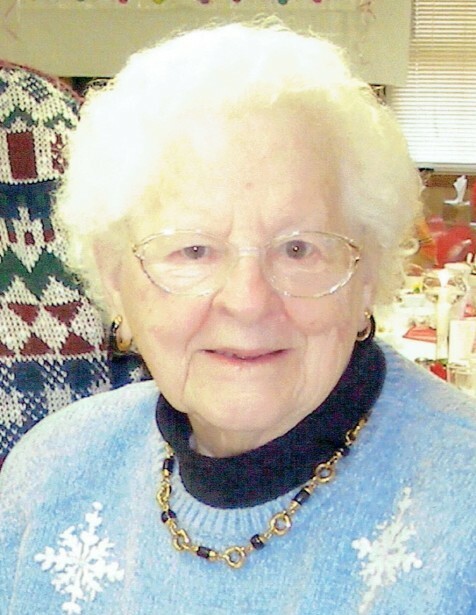 Obituary for Dorothy C. Marks | Heller-Hoenstine Funeral Home, Inc.
Dorothy C. Marks, 96, formerly of Yeagertown, passed away on Wednesday, Feb. 6, 2019, at William Penn Healthcare and Rehabilitation Center. Born April 1, 1922, in Yeagertown, she was a daughter of the late Frank and Charlotte (Wilson) Eward. In addition to her parents, she was preceded in death by: her husband of 70 years, Darlington F. “Hank” Marks Sr.; an infant daughter, Doreen Marks; brothers, Earl, James, Charles, Walter, Donald and Marshall Eward; sisters, Mabel Fultz, Daisy Smith and Martha Gregg; aunt, Ida McPherran, who raised her; and daughter-in-law, Shirley Marks. She is survived by: children, Darlington F. Marks Jr., of Yeagertown, and Darlene K. Gray and husband, Waldo R., of Yeagertown; grandchildren, David Marks and wife, Susan, Douglas Marks and wife, Tammy, Darla Rickert and husband, Matt, and Matthew Gray and wife, Kacy; great-grandchildren, Kayla Marks, Shannon Marks, Hunter Rickert, Chase Rickert, Laurel Gray and Juliette Gray; siblings, Lucy Bishop, Betty Bishop, Marie Kline, Ruth Kauffman and husband, James, and Robert Eward and wife, Patricia. Dorothy was a member of Freedom Avenue UMC and was very active within the church. She was a graduate of Yeagertown High School, Class of 1939. Dorothy enjoyed family picnics and family vacations to the beach at Wildwood, N.J. The family would like to thank the staff at William Penn and the home caregivers, Heather Dunkle and Siobhan Fitzpatrick, for all their support, kindness and compassion. A viewing will be held from 10 a.m. to 12 p.m., Saturday, Feb. 9, 2019, at Heller-Hoenstine Funeral Homes, 108 First Ave., Burnham, with a funeral service to follow at noon, with Pastor Randy Traxler officiating. Interment will take place at Birch Hill Cemetery. In lieu of flowers, memorial contributions may be made in Dorothy’s memory to: Freedom Avenue UMC, 511 East Freedom Ave., Burnham, PA 17009.